(How did the unidentified runner manage to balance a tray and a ball on his head, in that wind?) No photos of Tom, Flora or Gary G because they by-passed the camera. 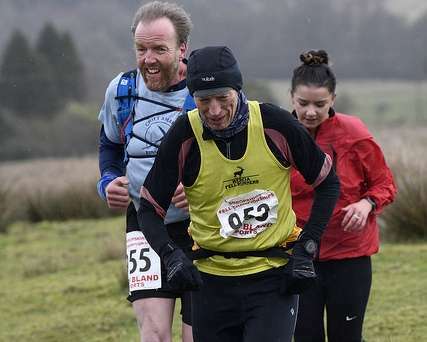 Six Crofters ran the short fell race (2.5 miles) from Cleeton St Mary to the summit and back, involving 229m of climb. Visibility this year was excellent, meaning you could see the trig point once on the top, and from there the finish was more or less visible, giving us something to aim for. Storm Erik did his best to blow us back down the hill, and by wearing waterproof top and leggings rather than carry them, I no doubt gave him more to aim at. From the start, Tom, Gary G, Flora and I headed up the southerly route, through an old croft (very apt) halfway up, and then following a diagonal towards the summit. Age and Erik meant I probably walked half the climb, and once having turned round at the trig point I failed to adjust to the change of pressures, and within 20m was bowled over. Picking myself up, and knowing Flora and then Gary were not too far behind I descended as fast as my feet would carry me ( Usain Bolt need have no worries! ), but taking care on the nasty protruding rocks on the sheep tracks. The winner, Daniel Connolly, was probably home by the time I got to the top, but he had a good tussle with Lloyd Taggart, finishing just 6 seconds ahead, in 19m 56s, leading the 43 strong field home. Gary P was first Croft runner back, 17th, in 25.47, followed by Tim, who had been at the Ludlow parkrun till 10am, a bare hour before the start, who was 27th, in 30.09. 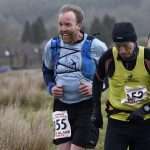 They may both be running again tomorrow over the Long Mynd Valleys course. I was next, 35th (33.55), having expected Gary to hare past me, but he and Flora seem to have taken a detour part way down, leaving Gary 39th (36.52) and Flora just behind (41st, 37.06, and 1st FV55). Plucky Tom, who never gives up despite everything, avoided the rockier descent, and returned the way we’d gone up, which has to be slower, involving as it does two stiles/fences to cross, but there are fewer rocks to trip on. 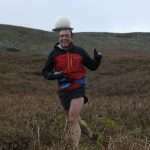 There now remain 3 races in the Shropshire winter series: Long Mynd Valleys, Cardingmill Canter and the Wrekin Fell race.